Within an hour from Guangzhou, Zhaoqing is a fantastic place to spend a few days exploring. It’s a lively city with its own miniature version of Guilin’s famous karst scenery smack- bang in the centre in the form of the Seven Star Crags Scenic Zone; a massive park and lake area. 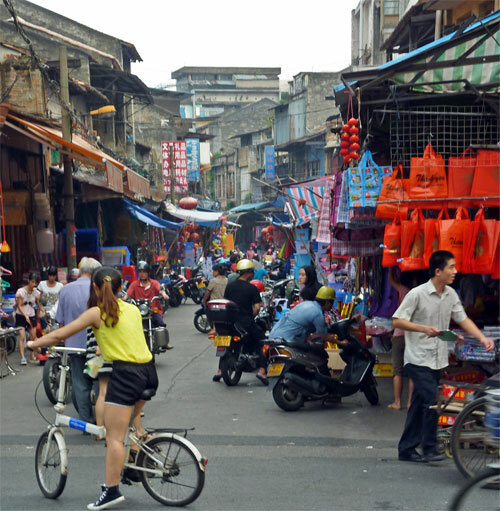 Moreover, Zhaoqing still preserves some interesting, old downtown areas to wander around and explore the traditional shop-houses, the tiny dwellings built onto the city walls and the occasional riverside pagoda. 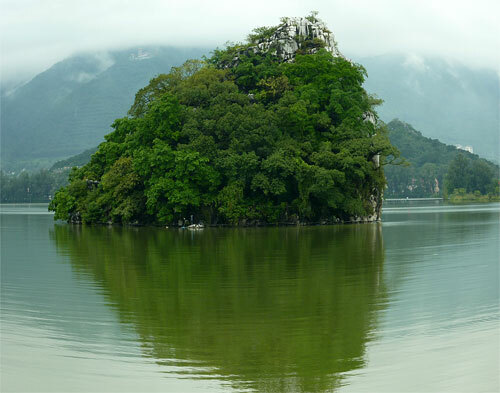 Nearby, China’s first Biosphere Reserve, Dinghushan 鼎湖山, lies on the outskirts of the city. Just an hour away by local bus are the time-forgotten, completely un-spoilt ancient Bagua Villages of Licha Cun and Xianggang Cun. Add to all this a great night market with restaurants spilling out into the street, serving excellent Cantonese food and you couldn’t really ask for more. Incidentally, though the city is popular with Chinese visitors, you are unlikely to see another foreigner during your stay. 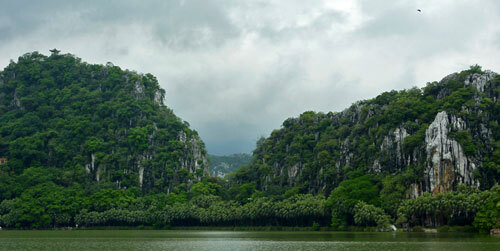 In Zhaoqing city, the undisputed main attraction is the Seven Star Crags Scenic Zone, which has been a tourist spot since ancient times. 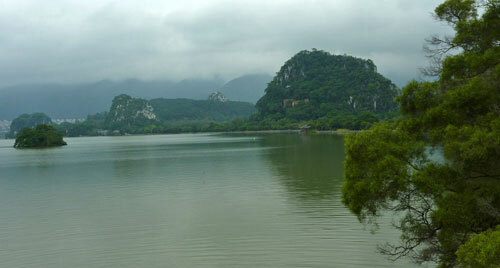 It owes its fame to the Guilin-esque limestone rock formations that shoot out of the huge lakes in the centre of town. There are temples, pavilions and winding paths leading to view points, caves and grottoes all over the park. 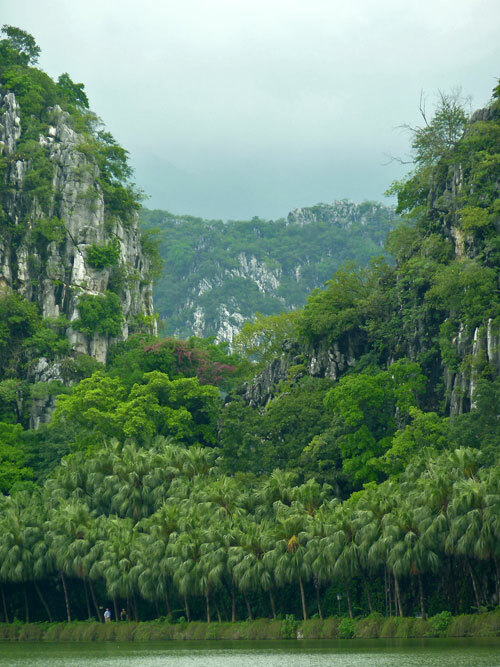 The vegetation is tropical and quite stunning, with avenues of swaying, feathery palm trees, water lily ponds, ancient trees with gnarled roots that crawl along the park floor, or dip their wavy, hairy branches into the lake waters. 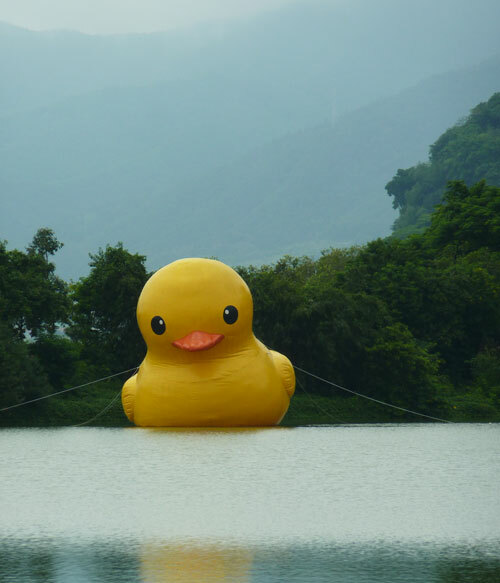 The only naff part we saw was a replica of the massive inflatable duck that had first caused a sensation in Hong Kong and was now becoming popular all over China. While this is no Guilin, the Seven Star Crags Park is a great place to spend half a day wandering amongst some pretty spectacular scenery. We visited on a week day in the middle of September and had the place almost to ourselves. We took a taxi to one of the more popular entrances, surrounded by meadows adorned by colourful, larger than life, sculptures representing all the Olympic sports, and just started walking. Eventually, after three hours or so, we made our way back into the center of town along several causeways. 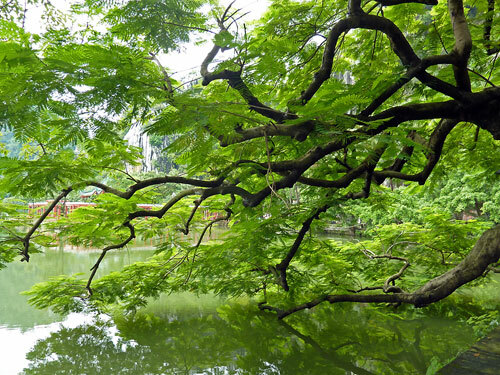 The park was a pleasant surprise and the limestone rocks protruding from the still lake are extremely attractive, especially against the backdrop of their urban setting, surrounded by high-rise buildings as they are. 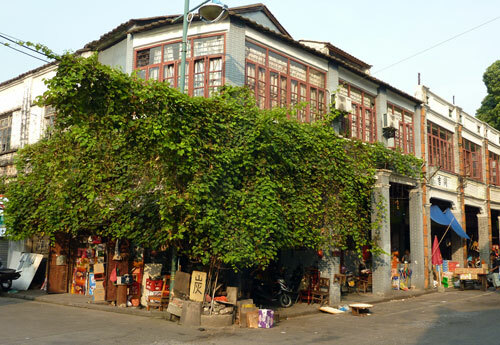 Downtown Zhaoqing still preserves a labyrinth of interconnecting, old alleyways that are home to some attractive vernacular architecture, in particular many early 20th century arcaded shop-houses overflowing with goods that spill out onto the pavements. There are all sorts of traditional products like bamboo steamers, woven baskets, stone vats and ceramic bowls of all sizes. In the side-alleys, there are smaller, two-storey dwellings with pointed roofs, looking like something out of a Brueghel painting. Many of the little houses are completely overgrown by creepers, or shaded by leafy trees. 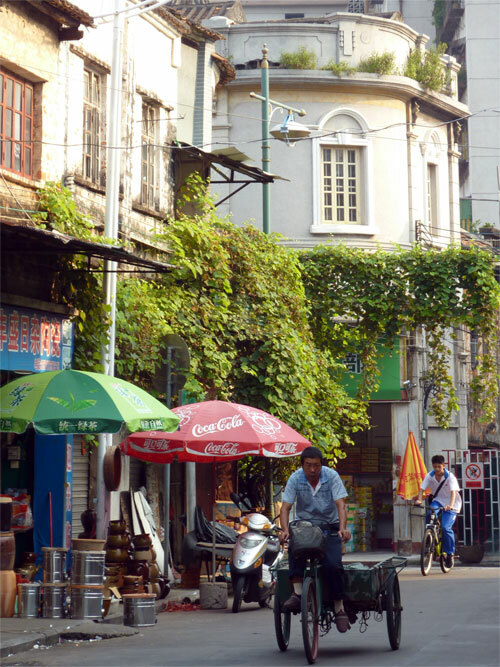 We climbed up onto a section of the old city wall; low white houses had been built onto it and their inhabitants used the wall to hang up their bird cages, put out their potted plants, grow vegetables, or dry their laundry on bamboo poles. Down by the muddy, chocolate-brown waters of the enormous Xijiang River, part of the Pearl River Delta, there is the ancient, white and brown layered Chongxi Pagoda which supposedly affords great views over the heavy river traffic. Unfortunately, it closes at 4.30 rather than the 5.00 mentioned in our guidebook, so we missed out on the vistas. Instead, we had to content ourselves with a hot stroll under the merciless sun beating down on the riverfront. 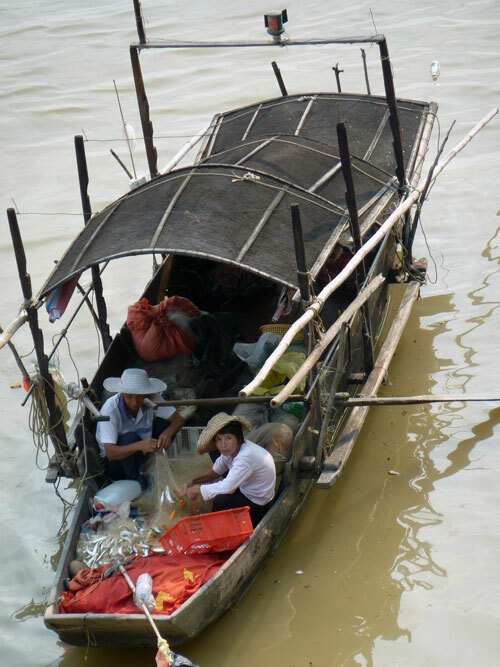 However, the river is still a real working river, with boats of all shapes and sizes. 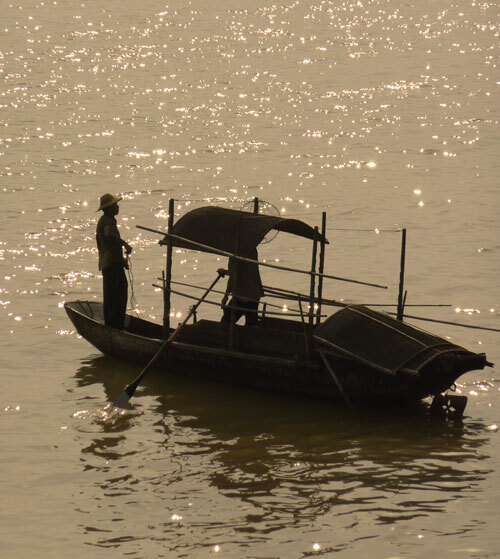 We were pleased to see that many people continued to fish in the same traditional wooden sampans as their ancestors; rickety wooden vessels, covered and shaded by bamboo screens. 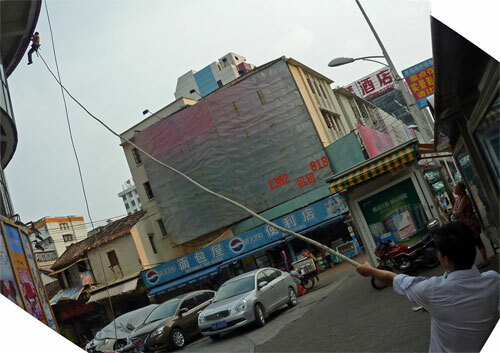 Workers live dangerously in Zhaoqing. 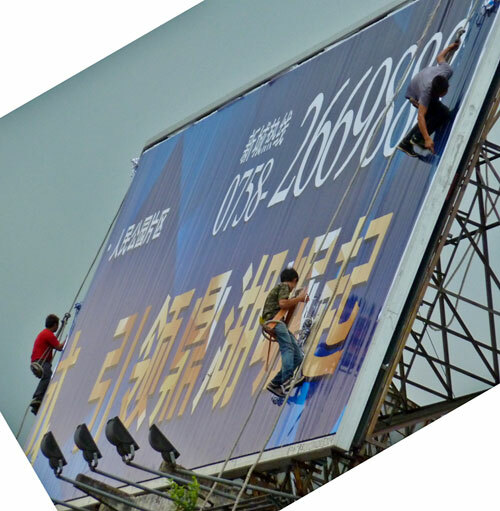 On a number of occasions we saw young boys scrambling up and down advertising hoardings atop high-rises, changing the posters, or dangling off buildings on flimsy ropes, trying to fix the lights, with complete disregard for the life- threatening drops below. We could just imagine health and safety inspectors having a field day back home. Zhaoqing is a wonderful place to dine out especially its street food. 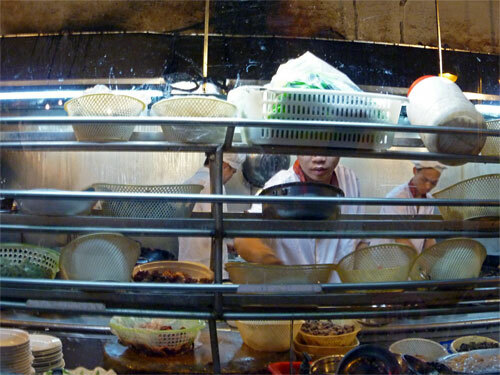 Near the bus station there is a street lined with simple restaurants serving spectacular Cantonese food. We tried several and each one was delicious. 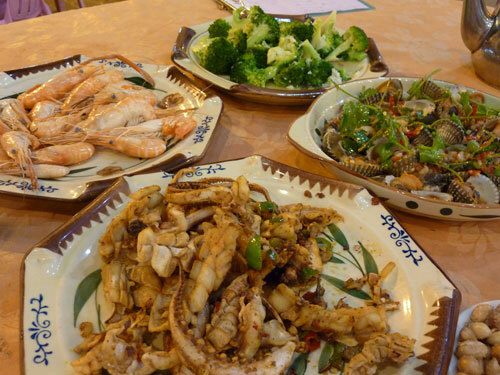 Some of the highlights were crispy squid, freshly cooked prawns and spicy clams. Street food in China doesn’t get much better. We stayed at the Hubin Hotel in Zhaoqinq, where a simple, but excellent-value double with a terrace and lake view cost 200 yuan. 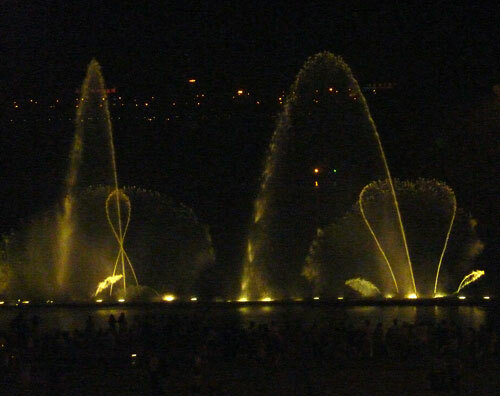 The hotel has great views of the light and water show held every evening. Buses between Guangzhou and Zhaoqing run almost every 30 minutes and take about an hour and a half. There are also regular buses to Kaiping (For the Diao Lou). Jennifer, I have information for you from ABA in Louisville. Could you please forward your email address.